NOTE: This is a guest blog post from Ryan Kempster, a marine neuroecologist (sensory biologist) from the Oceans Institute at the University of Western Australia and founder of the shark conservation group Support Our Sharks. Ryan is currently completing his PhD research into the electrosensory capabilities of sharks and their relatives with the ultimate goal of refining and improving electrical repellent devices to better protect people in the water. You can learn more about Ryan and his research at www.ryankempster.com. In Western Australia (WA), politicians and members of the public are calling for a shark cull in response to the state’s recent shark attack fatalities. The most recent of these attacks was on a diver off the north coast of Rottnest Island on October 22. The other, involving a body-boarder, took place at Bunker Bay on September 4, and a disappearance at Cottesloe Beach on October 10 has also been attributed to a shark. The proposed cull is a misguided attempt by politicians to protect beachgoers from potential attack. But is this the best way to deal with an animal whose natural environment we invade by the thousands every day? No; and this is why we are looking for your support to oppose such an ill-advised action by the WA government. How many people are killed by sharks each year? Although the Australian media continue to sensationalize the threat of shark attacks to swimmers, the statistics do not support these claims. According to the Australian Shark Attack File (ASAF), sharks have killed 52 people in the past 50 years (1.04 per year) in Australian waters. Figures range from zero to three in a year (data correct as of October 24, 2011). There’s no denying that each of these attacks is, of course, a tragedy. But the number of attacks is negligible when you consider the vast and increasing number of swimmers entering our coastal waters every year. Are there more shark attacks? Thousands more swimmers take to our beaches every year as the WA population and tourism continue to rise, so we might expect a corresponding rise in shark attacks. 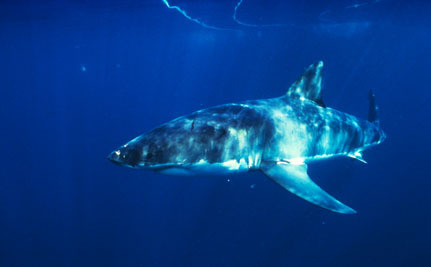 However, numbers of fatal shark attacks remain the same and within the expected yearly variation. Therefore, the number of fatal attacks in WA, per capita, is actually declining. The number of shark attacks has nothing to do with how many sharks are in the water but everything to do with how many people are in the water. Sensationalized reports will have us believe there are rogue “man eating” sharks patrolling the waters, with shark attacks on the increase. But even if we consider the recent disappearance of a swimmer at Cottesloe beach as a shark attack (although unconfirmed), then in reality there have only been three fatal attacks in WA in the past 12 months. The prime suspect implicated in all of these attacks is the species responsible for most fatal attacks, the white shark (Carcharodon carcharias). Since it was declared a vulnerable species in the late 1990s, there have been anecdotal reports that shark numbers have increased. Some say this is the cause of the recent shark attacks in WA. “There is no scientific evidence to suggest that the short time period between these attacks is a reflection of an increase [in the] population size of white sharks. At this time, many people seem ready to begin a shark cull in a misguided attempt to feel more protected and to get revenge for the recent attacks. But we must keep a clear head and consider why sharks are in need of protection in the first place. Most sharks serve as top predators of the marine food pyramid, playing a critical role in our ocean ecosystems. Directly or indirectly, they regulate the natural balance of these ecosystems, and are an integral part of them. Removing sharks from our ocean ecosystems is very likely to be ecologically and economically devastating. Sharks are constantly misrepresented in the media as vengeful, deliberate predators of humans. It is, of course, nonsense. We must not allow this negative fictional image to form the basis of state or national policy. Revenge is not a meaningful strategy on which to base policy nor is it worthy of an educated nation such as Australia. Support shark conservation in Australia and oppose a cull by signing the petition to stop the shark culling in Australia. Breaking News: The End of Shark Finning In California! Yea, they will get rid of the natural balance of the oceans around them, then wonder why they are over-run with jellyfish like is happening in other ignorant areas around the globe. We are visitors to their teritory. Sharks are one of, if not the oldest, animal on this planet. They are critical for scientific study, and as part of the larger ecosystem. Leave them alone ... and stay out of their habitat! I am sorry for the ones who died from shark attacks ,but the sea is the sharks home not ours ,they don't know they aren't supposed to eat humans,anything moving they would probably check it out,and it is so dangerous to go into the water at certain times and on your own,-leave the sharks alone . people kill more of their own as animals kill people. Isn't it insane, "we" want to have the only right to kill another life, so "we" hunt animals like wolfes, etc. all these animals who could be some "rivals". As if "we" were in the Stone Age, but then people only took what was necessary and not more - as "we" do today. And when an animal attacks or kill on of "us", "we" want death penalty. How many sharks have people killed during the last 50 years? And in what manner? And on what purpose? - For pure plesure, without any necessary need. GRRRRRRR! Let the sharks have the oceans FOR THEM SELVES and humans are to stay in their urban areas. There should be strong fences build around the cities and people locked inside, for ever and ever and ever . . . Ocens belong to sharks who lived in them when dinosauruses roamed on the earth. We are the last arrivals, and can make no claims for the seas . Ugh! I feel like throwing up! Isn't it sad how the media can create such an image and create such hate? How easily we are lead into fear and abhorrence. i saw a documentary. sharks abhor the smell of their own dead. if somehow one can recreate a perfume of this scent it can be a deterent. sharks go limp when flipped on their back. some sharks need to move to "breath". Orcas discoverd how to stun and flip over and hold Greatwhites upside down. water cannot move over their gills so they drownd. other sharks find detour routs where they do this. humans kill 100 million sharks a year. Sharks are living Dinosaurs and deserve to be protected! They are vital to our oceans and marine ecosystems. I urge you to sign any petition you see that fights to protect these wonderful creatures!